I love the smell of Spring. Yes, I believe Spring has its own smell and it smells like new beginnings…and I love new beginnings. Spring gives us the chance to start over again each year, reinventing ourselves with the hopes of shedding the ugly and highlighting the positive. As the world around us starts gaining its color back, we seem to find a renewed energy within ourselves. 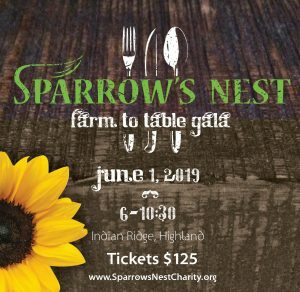 I can’t think of a better month to celebrate Sparrow’s Nest as our charity begins a new phase of growth in the Hudson Valley. We hope you join us on March 16th for Sparrow’s Nest Dress Down Day, a time to wear our latest colored shirt and spread awareness so we can reach people who may not know who we are or what we do…because our growth is a direct result of this wonderful community helping us spread the word. If you would like one of our snazzy shirts, you can find more information here, but beware…we are almost sold out!!! Use this upcoming month to focus on your own growth mentally, physically and spiritually and if you don’t get it right this time, there is always time to begin again. Save the Date: We’re planning a Farm To Table Gala on June 1st, and we’ll be sharing all the details soon!